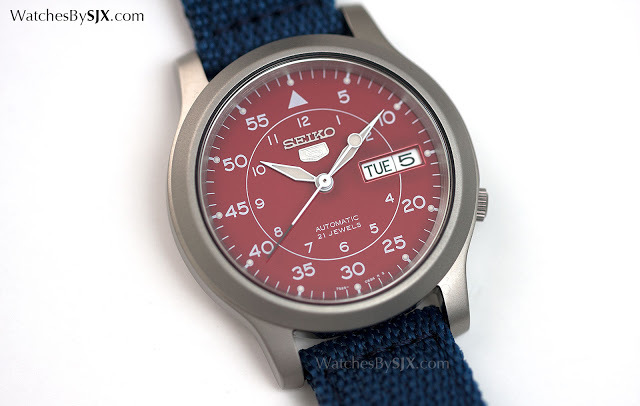 One of the best value propositions the watch world, the Seiko 5 Military is now available with a red dial as a special edition for internet retailer Amazon. 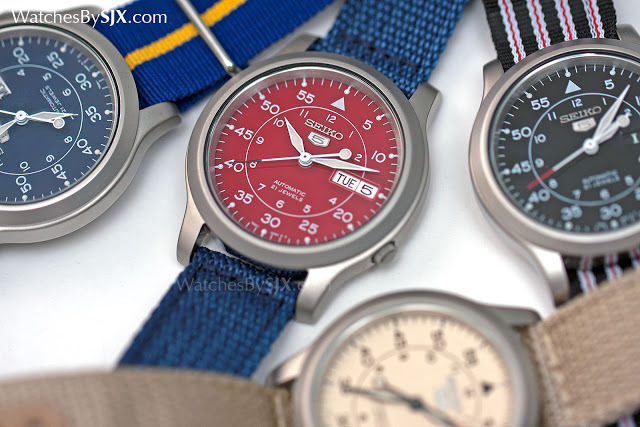 Automatic and inspired by the Baumuster B dials of beobachtungsuhr (observation watches) used by Second World War German aviators, the Seiko 5 Military costs as little as US$50 – making it one of the all time great buys in mechanical watches. The Seiko 5 Military is now also available with an unusual red dial, a special edition that’s, surprisingly enough, exclusive to Amazon (ref. SNKM95). The Amazon edition has the five features that gives the Seiko 5 its name: automatic winding, day and date in one window, crown at four o’clock, water resistance, plus a durable case and bracelet. 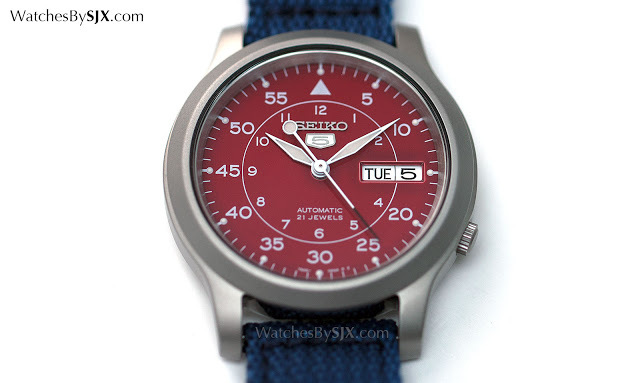 Originally offered in black, blue, khaki or green, the Seiko 5 Military Amazon edition has a bright red dial, while the lume is an ivory tone. Aside from the dial it’s identical to the standard Seiko 5 Military, with a 37mm steel case with a matte sandblasted finish. Visible through the display back is the calibre 7S26, a self-winding movement with Magic Lever winding mechanism invented by Seiko (that functions similarly to IWC Pellaton winding) and a 41 hour power reserve. Rated to -20 to +40 seconds a day, the movement is basic and looks that part, but its lack of visual appeal is made up for by robustness; this will run for a long, long time. 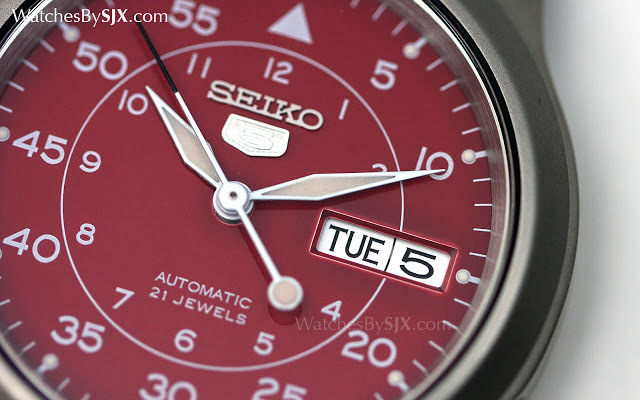 The crystal on the front and back are Hardlex, Seiko’s trade name for hardened mineral glass. 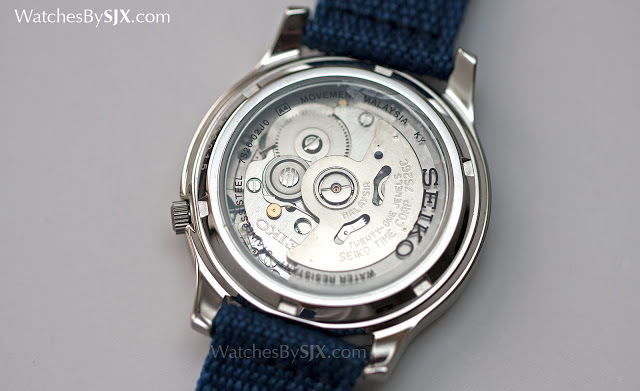 Sold with a blue canvas strap, the Seiko 5 Amazon Exclusive SNKM95 retails for US$89.99 though it’s occasionally available for less. It is available only from Amazon*. *Affiliate link that supports this website. For its 100th anniversary Seiko has created a series of four, blue themed limited edition sports watches, amongst them the Monster SRP455K1.